The classic game of backgammon (ban-sugoroku), in which players roll dice to see who can be first to move 15 pieces across a board and into enemy territory, arrived in Japan from China in the 8th century. It remained popular among the nobility until the 17th century, at which point it was supplanted by e-sugoroku (picture backgammon). In this variation the board is replaced by a large sheet of paper divided into colorful sections, each with an illustration. Initially, the e-sugoroku sheets were didactic and Buddhist in nature, with the goal being to reach heaven safely (at least your piece, that is, thanks to a good roll of the dice) and not land in hell. One can imagine this type of entertainment being altogether too serious for the Japanese spirit, however, and sure enough, by the time the fun-loving merchant class finished their make-over of the concept, the illustrations had become unmistakably floating world in character — scenic landmarks, kabuki imagery, and ribald jokes of a sexual or scatological bent. Fig. 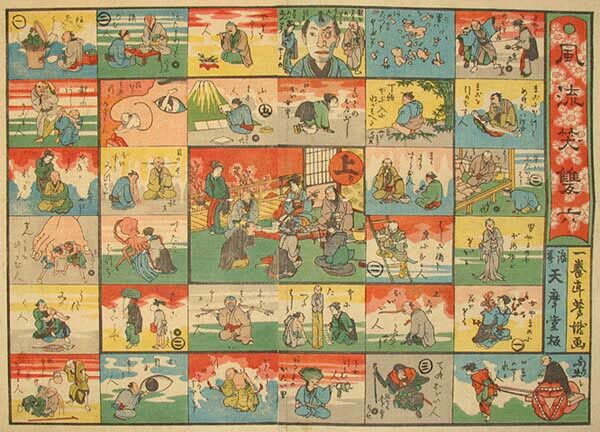 1 is a circa 1865 sugoroku print by the Osaka artist Ichiyôtei Yoshitaki (1841-99), published by Naniwa Tenmado and titled Furyu warai sugoroku (Fashionably funny sugoroku). Measuring 50 x 37 cm, actually rather small for such a game sheet, it consists of two standard ôban sheets glued together at the center. Players start in the lower right corner and proceed in a clockwise spiral toward the center (agari). In this case, in order to arrive as a guest at the very inviting geisha-filled cherry-viewing party, players need to negotiate a hellish assortment of grotesque visuals. Can you spot the man crawling out of a nostril? 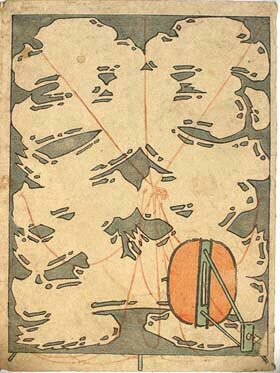 Or, executed with a wink and a nod to Hokusai, the lady with the octopus and the multi-legged pants? No? Well, just as well. Along the journey of zany colors and outrageous puns, a player might be labeled a thief, a master of farting, or far, far worse. Not really suitable for the kids, one might think, but then again the black ink circled numbers brushed on the sheet do suggest a fairly childish hand. Many types of special edition and novelty prints, and picture books too, were originally sold with woodblock-printed wrappers. Most of these items have gone astray over time, but Fig. 2, the cover for the Yoshitaki sugoroku, is a rare survivor. Announcing 'warai sugoroku' in very bold characters, this accompaniment to the game sheet is meant to resemble a large, hand-painted kite. Such a design would be ideal for the New Year season, a time, now as well as then, to relax with friends, and sake, and enjoy amusing woodblock prints in a different, hands-on way. This article originally appeared in Daruma, no. 36, Autum 2002. Copyrighted © text and pictures reprinted with permission.